The vine lives to the rhythm of the seasons and requires constant attention. Every day, we listen to nature to make our champagnes exceptional wines. Because "you only have a good wine from a good grape, and to be tasty, the vineyard must above all be healthy"
We select the fruiting shoots depending on the kind of pruning we do. 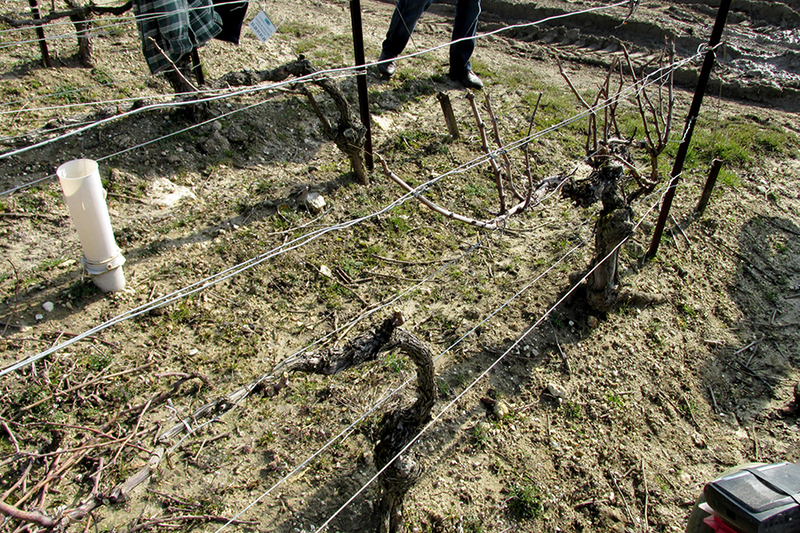 At home, we practice only Chablis pruning, allowing better ventilation of the grapes. Tying-up happens in the course of pruning. We attach the fruiting shoots on two wires linkers. A manual operation that requires precision and speed. Remove buds developed on old frames and foot that are not useful. Operation that consists in riding the wires from both sides of the row of vines to keep shoots from the fruiting buds that develop. This is done twice: 1 lift and 2nd lift. The goal of palissage is to straighten the fruiting shoots and to order them within the row of vines. We separate each foot vines with biodegradable staples for the respect of the environment. Application of pesticides to fight major diseases of the vine which are: mildew and oidium. As sustainable culture, we use no pesticides anymore and other products used are not listed carcinogens. Our approach is to use the least amount of product possible. Our vineyard provider will use two electric tractors to work in our vineyards, which will decrease the carbon index. Since A year and a half, we use no weed killer anymore. We leave a natural vegetated strip downtown roads on each side. We perform mechanical work under the rank of vine.